These images taken by NASA’s Hubble Space Telescope reveal a new type of stellar explosion produced by the merger of two compact objects: either two neutron stars or a neutron star and a black hole. The galaxy in the center of the left image produced the gamma-ray burst, whose lingering effects were visible on June 13 but had faded by July 3. Cataclysmic crashes involving black holes and ultradense neutron stars may explain the briefest of the most powerful explosions in the universe, scientists say. NASA scientists are calling the new type of short, but intense, cosmic collision and conflagration a "kilonova," an explosion so powerful it is 1,000 times stronger than a typical star explosion, called a nova. Such events have long been predicted by astronomers, but never seen until now, researchers said. The discovery could shed light on the origin of heavy elements such as gold and platinum, they added. Gamma-ray bursts are the most intense outbursts ever detected, giving off as much energy in an instant as our sun will beam out during its entire 10-billion-year lifetime. A nearby burst directed at Earth could easily cause a mass extinction, researchers say. There are two kinds of gamma-ray bursts - ones that are longer-lived, lasting more than two seconds, and less common short-lived ones, lasting about two seconds or less. Scientists have suggested these brief gamma-ray bursts might be caused by cataclysmic mergers of incredibly dense cosmic bodies - either two neutron stars (the tiny remnants of exploded stars) or a neutron star and a black hole. However, they lacked evidence until now. Astronomer Nial Tanvir at the University of Leicester in England and his colleagues analyzed the short gamma-ray burst GRB 130603B, which exploded about 4 billion light-years away on June 3. NASA's Swift satellite measured it as 0.18 seconds long, while NASA's Wind spacecraft determined that it lasted only 0.09 seconds. The mergers of dense cosmic bodies that are thought to cause short gamma-ray bursts can also blast out neutron-rich gas that rapidly generates heavy elements such as gold and platinum, scientists say. These "r-process" elements can undergo radioactive decay and release an enormous amount of energy - 1,000 times or so that given off by stellar explosions such as novas. These powerful events are thus known as "kilonovas" ("kilo" means "thousand" in Greek). This sequence illustrates a model for the formation of a short-duration gamma-ray burst to become a powerful kilonova explosion. Here, two neutron stars circle one another and ultimately collide to kick out highly radioactive material. This material heats up and expands, emitting a burst of light called a kilonova. An accompanying gamma-ray burst lasts just one-tenth of a second, but is 100 billion times brighter than the kilonova flash. Image released Aug. 3, 2013. 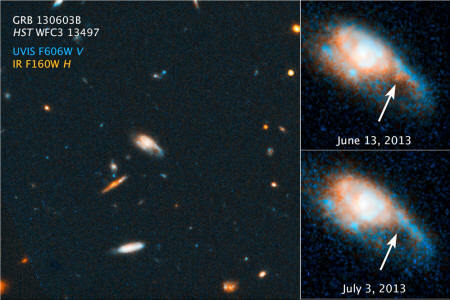 NASA's Hubble Space Telescope revealed that the near-infrared afterglow that accompanied GRB 130603B was the kind one would expect from a kilonova. This is smoking-gun evidence that an explosive merger caused the gamma-ray burst, Tanvir told SPACE.com. "This is just the first example, and we will have to search for and study others to be completely sure, but it certainly looks right," Tanvir said. 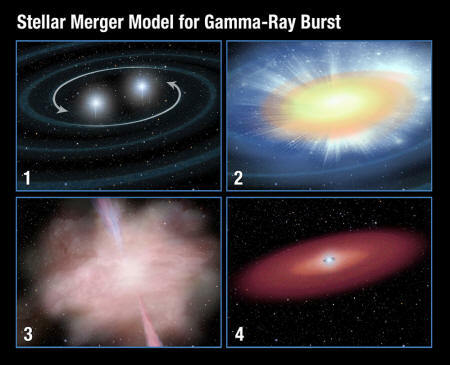 It remains uncertain what kind of merger caused this kilonova and gamma-ray burst. "still have many uncertainties, so it is too early to try to distinguish these possibilities," Tanvir said. In the future, the researchers aim to find other examples of kilonovas accompanying short gamma-ray bursts. Tanvir added that future research into kilonovas could shed light on the origin of r-process elements. "The r-process elements are heavy elements whose origin we have long been uncertain about," Tanvir said. "They are not produced in normal stars, and astronomers have generally assumed they must be created in supernovae. However, the calculations suggest supernovae may not be good at creating those elements, so it is possible that kilonovae from merging compact objects may be the primary route in the universe to producing these elements." The scientists detailed their findings online Aug. 3 in the journal Nature.